James and I decided to take a side trip to Rhodes. The islands of Kos, Symi and Rhodes are just off the south-western Turkish coast and they are close, a just short ferry trip away. Rhodes was a completely different Greek island, even though the ancient Greeks and Romans had preceded us there and left ruins to be be seen. 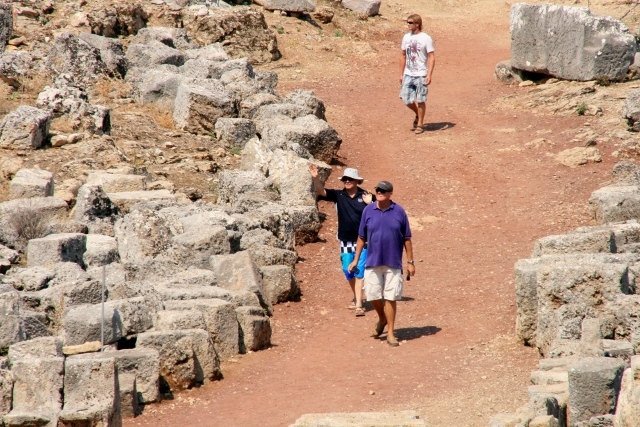 What was different is that Rhodes is the oldest medieval city in western Europe. The medieval architecture and history of Rhodes Town and its citadel dominate the landscape and our imaginations. 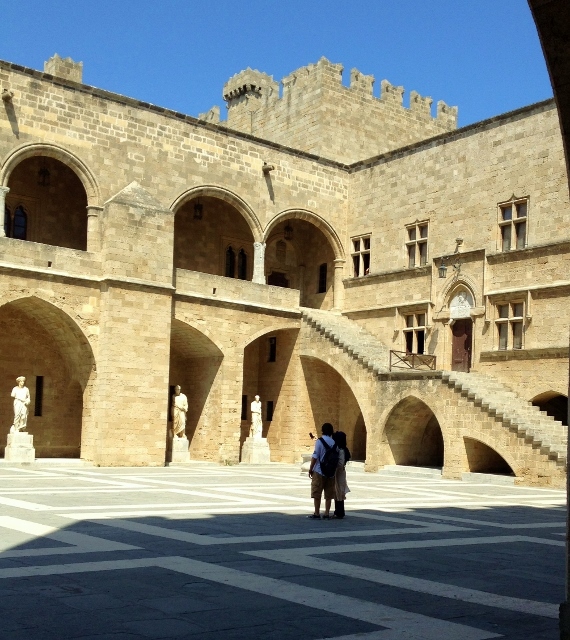 We visited the Palace of the Grand Masters and learned that the exhibitions contained within were put together in 1993 as the 2,400th anniversary of the foundation of the city of Rhodes in 408 BC. 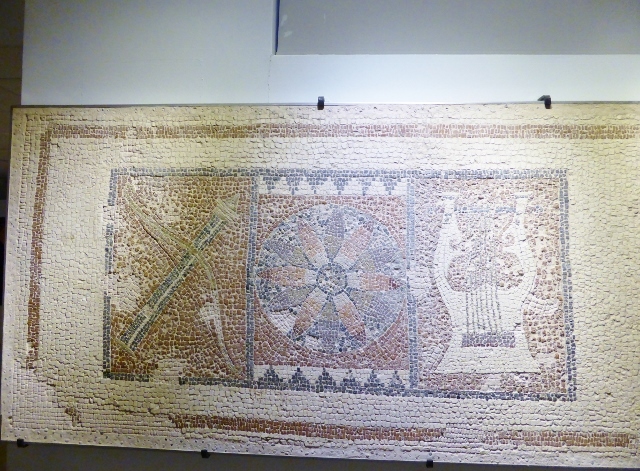 Many Roman mosaics were collected from Kos and other Greek islands and built into the palace, looking like Turkish Rugs on the marble floors. 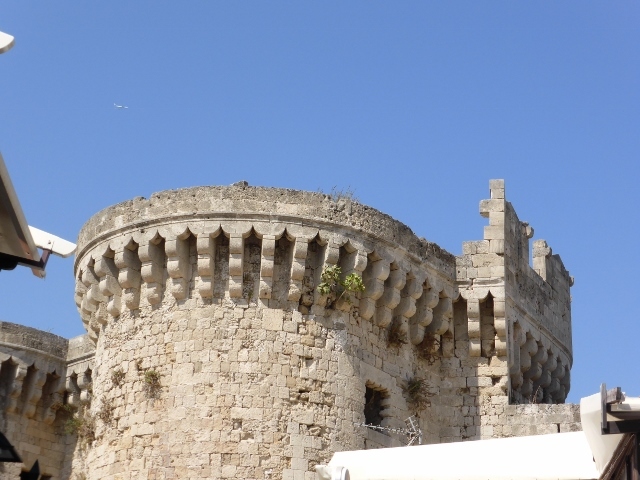 The Knights of Rhodes were founded in the 11th Century by merchants from Amalfi. As a group knights were made of Roman Catholic men usually of noble birth from Italy, France, England, Provence, Spain, Auvergne (France) and Germany. The Knights were also famous for their hospitals, so if you were ill or wounded you would be brought to the nearby hospital for care. There is also a street called the Street of the Knights, where the knights lived and met. Each country had their own building on the street. Turks lived in Rhodes during the reign of the Knights and after Suleiman finally conquered Rhodes . 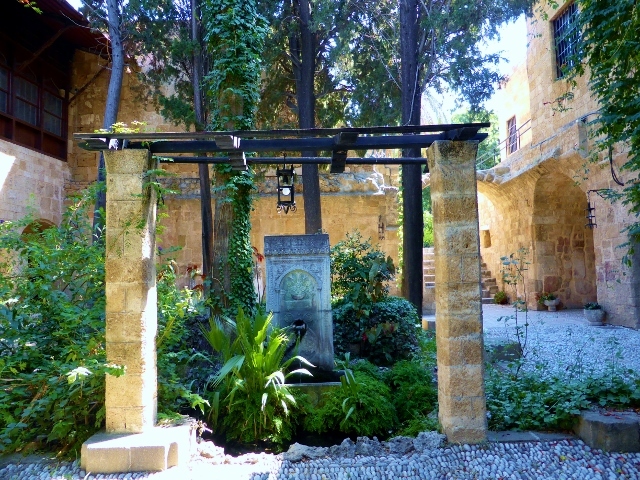 Minarets, fountains and gardens imprinted the Turkish presence on Rhodes Town. 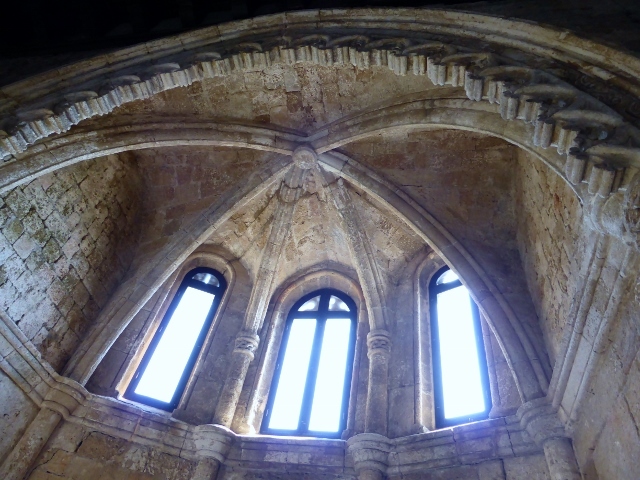 The hospital of the Knights of St. John was a very evocative building, It was all too easy to imagine the injured and ill, so far from home and looking up at the stone ceilings, listening to screams and moans, wondering if you would ever see your home again. To add to the sinister feeling of this old colonnade, the area contains tombstones of the knights, confirming that many never did see their homes again. 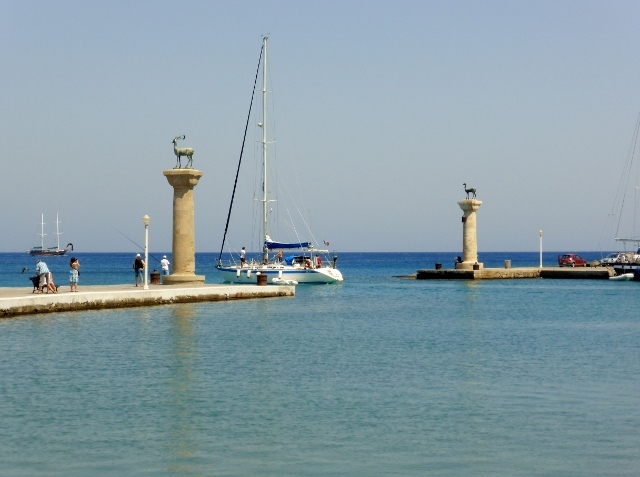 The Colossus of Rhodes was not to be seen but Mandraki Harbour is still beautiful and you can almost imagine sailing underneath the Colossus into Mandraki Harbour. 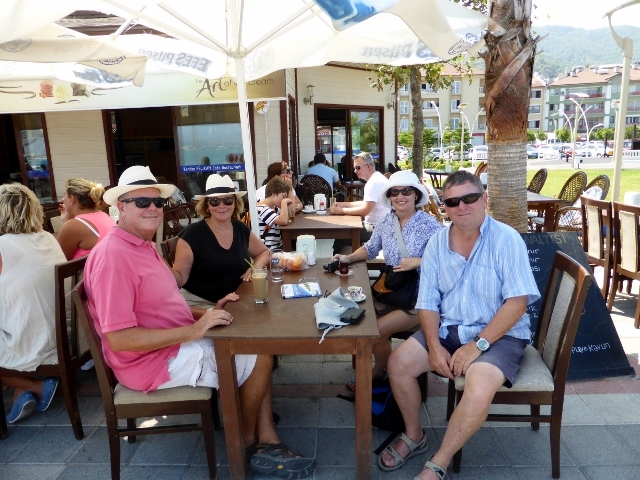 We are in Fethiye, waiting to see if Beneteau is going to arrange warranty work for us. It is very hot. 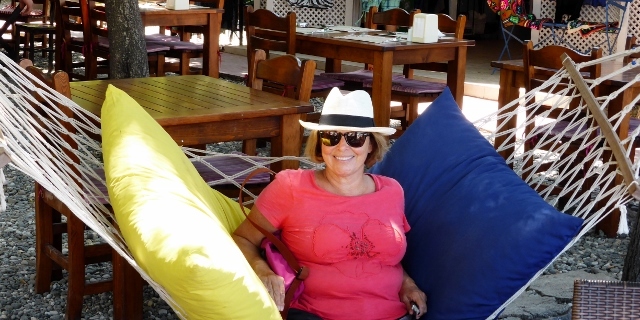 I would say August in Southern Turkey is not for the heat averse. We now fully regret our mocking laughs at yachts with air conditioning. Last night we had a block of ice in front of a fan, tonight we will try wet sheets in front of the bucket of ice. Yes,yes, I know our life is so glamorous. 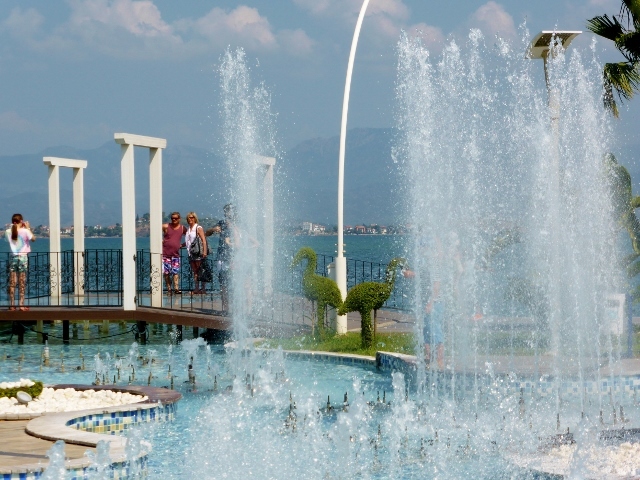 Ok enough of the chat, we went to a small but perfectly appointed museum, with air conditioning, in Fethiye yesterday. 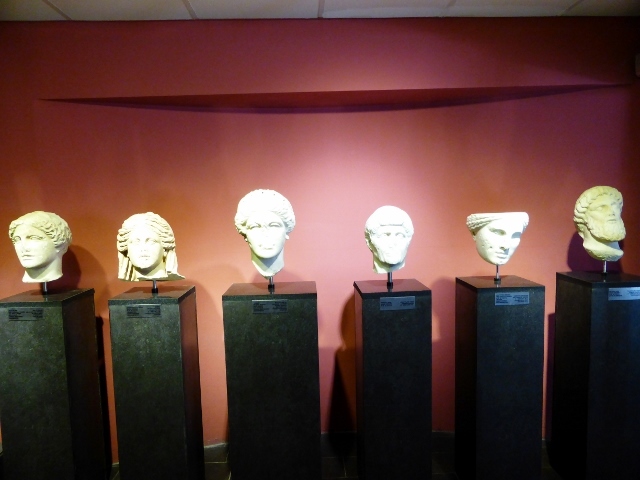 Most of the finds, are from the Lycian, Hellenistic and Roman periods and there are beautiful and fascinating pieces in this tiny museum. The lovely extra seems to be the photos on the wall of where these antiquities have come from and drawings showing you how they used the various altar stones. Imagination injections as it were. I will rely heavily on the museum notes, because they give the details in italics. 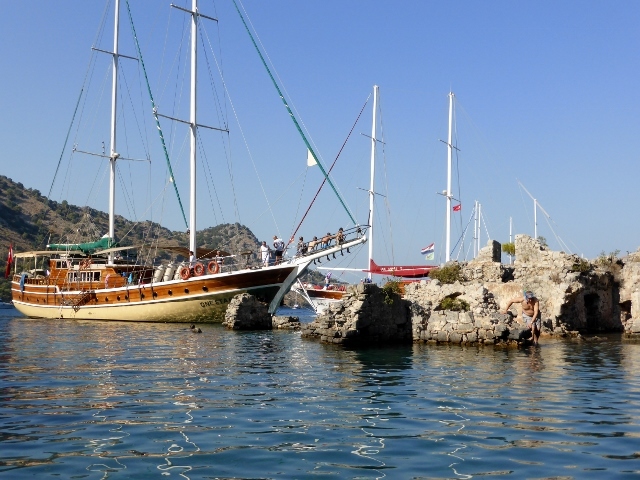 If you are coming to Fethiye, be sure to visit. 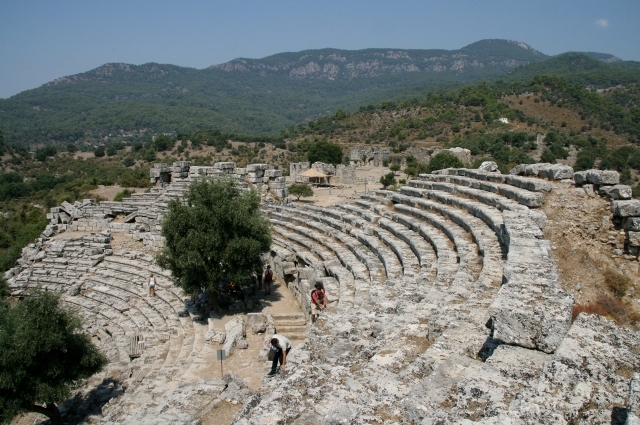 Back in the ancient times of the Greeks, the Lycians were a small city state federation between Fethiye and Antalya. They were matriarchal. Herodotos noted: “They have customs that resemble no one else’s. They use their mother’s name instead of their father’s. If one Lycian asks another from whom he is descended, he gives the name of his mother. And if a citizen woman should cohabit with a slave, the children are considered of free birth; but if a citizen man, even the foremost of them, has a foreign wife or mistress, the children are without honour“. 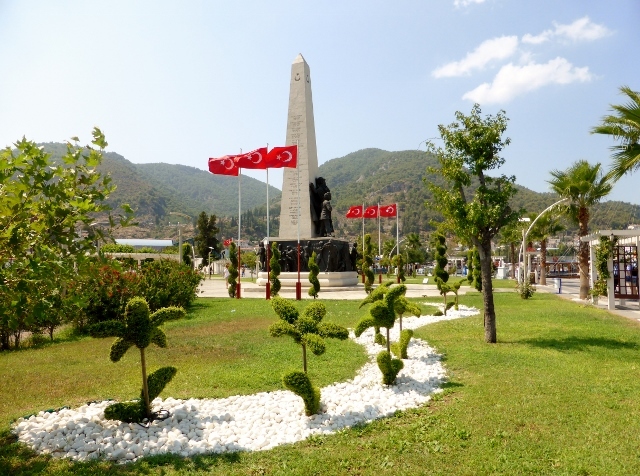 I love a reference I saw on lycianturkey.com, that the Lycians most resemble the Swiss, hard-working, wealthy peace-loving nation, but fierce if attacked. It does give you a sense of who they were. 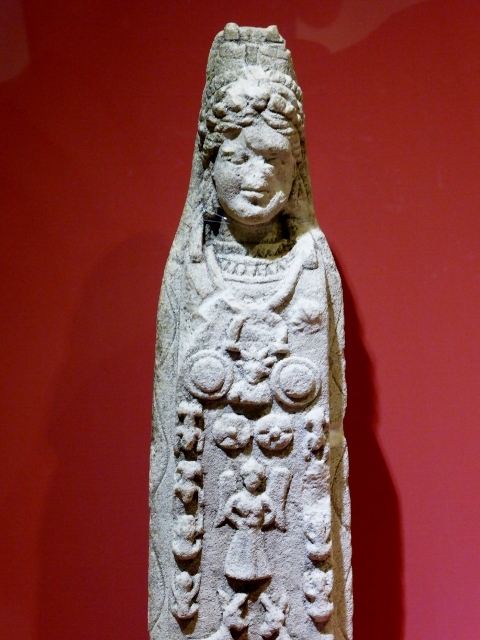 The Lycians had their own language and one of the most exciting finds in this area of Turkey has been the trilingual stele from Letoon. Each of three sides had inscriptions in Greek, Lycian and Aramaic. 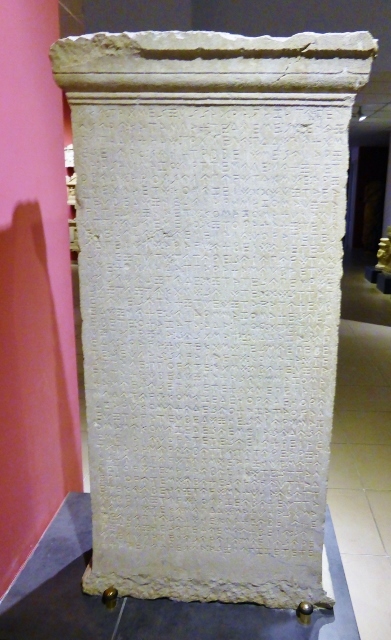 It was the Rosetta stone for the Lycian language, allowing scholars to interpret the Lycian inscriptions. 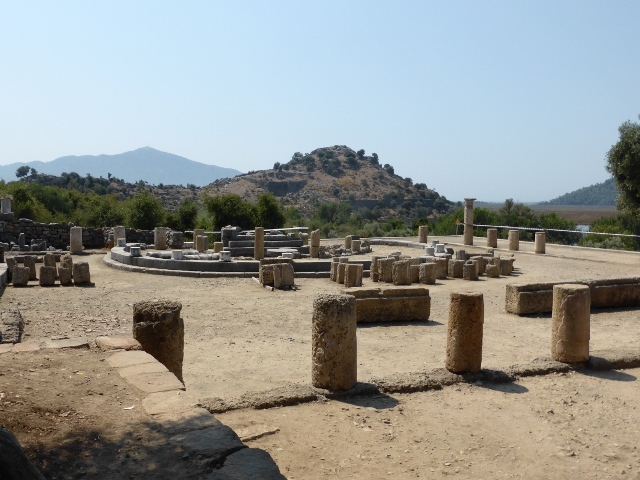 It also shows that Lycia was a melting pot of merchants and traders, a cross-road between East and West. 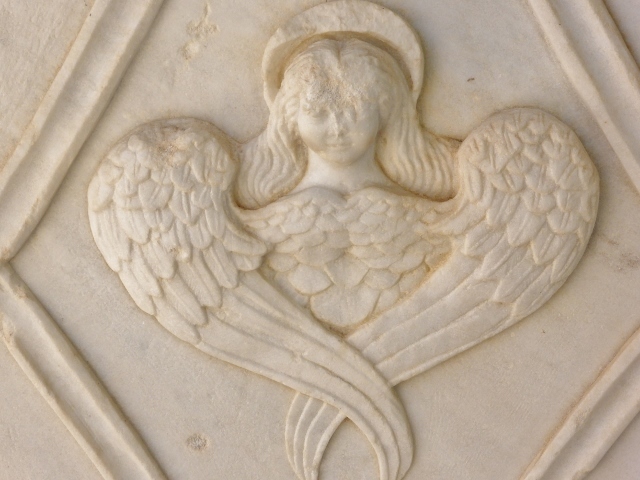 As to what important message was carved into a monument like this? They were creating an altar and setting up a new cult to the mythological King Kaunos and Artemis and who the new administrator was. You thought I was going say taxes, didn’t you? The angel is appropriate as my cousin Carol De Angelo is celebrating her Golden Jubilee as a Sister of Charity. Our love and congratulations to you, Carol. Happy birthday to Nancy O’Brien, Sean Waters and Blake Johnson. Hope it is a good day for everyone. The dreadful heat pushed us into port and the wonderful thought of an air conditioned room. 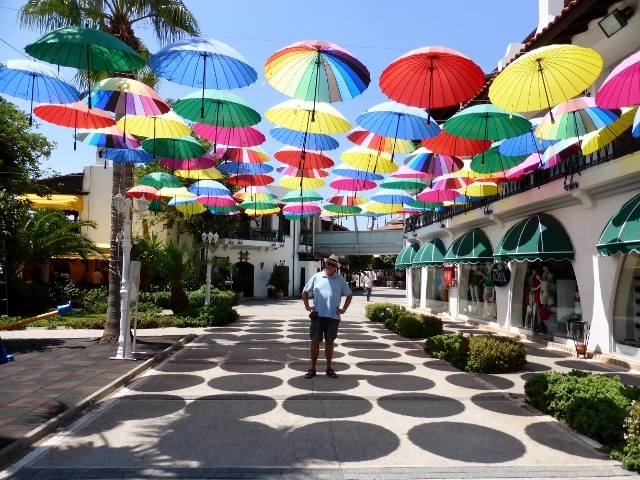 No one had slept well for about three nights, but Fethiye promised to bring us bliss: air conditioning, cool drinks and a lovely pool with shade umbrellas. 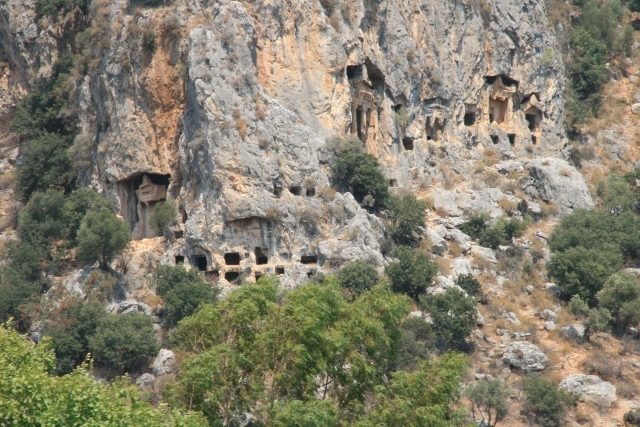 On Tuesday, our energy recovered, we decided to take a taxi to see more Lycian tombs. We saw an air conditioned cab and he took us up the hill to see first the castle, a very ruined site that may have been used by the Crusaders and then up to the Lycian Tombs. The tombs are at the high point of any given towns so the souls have an easy journey to the heavens. The biggest tomb belonged to the once rich or famous Amyntas or Aminthas, because there was an inscription to identity him. 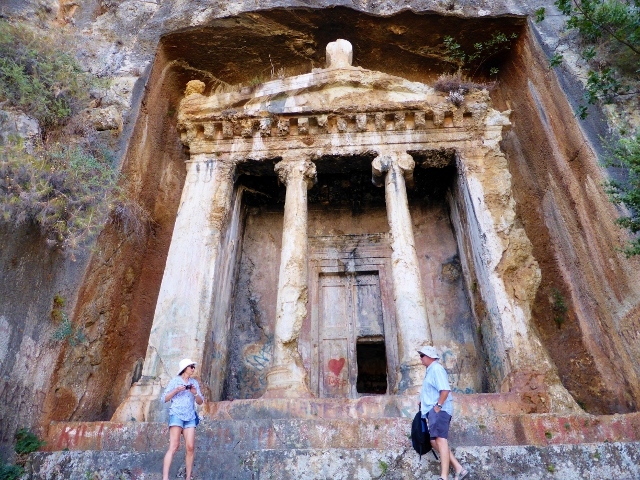 This tomb is circa 4th century BC and is carved from the local rock in the shape of a temple portico. It is about the equivalent of 6 or 7 flights of stairs to reach the tomb, which is intact except for damage mainly caused by rain seepage and graffiti. 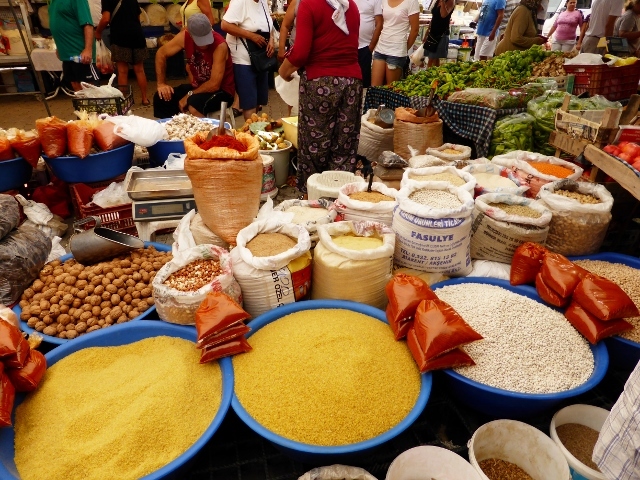 Then we went to the Fethiye Tuesday markets, vibrant with food, grains, spices and cheese. The stall holders are men and woman with the gift of chat and cheek. They are entertainment which has stayed the course of time. There is also a market full of clothing and hand bags, mainly fakes. 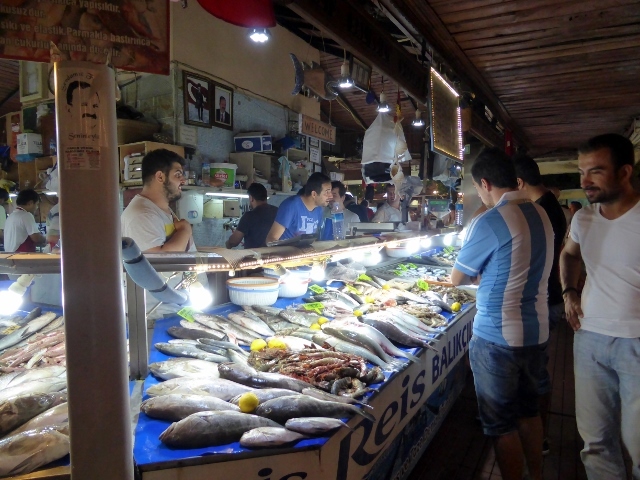 But to Blue and James, the most important market was the fish market. 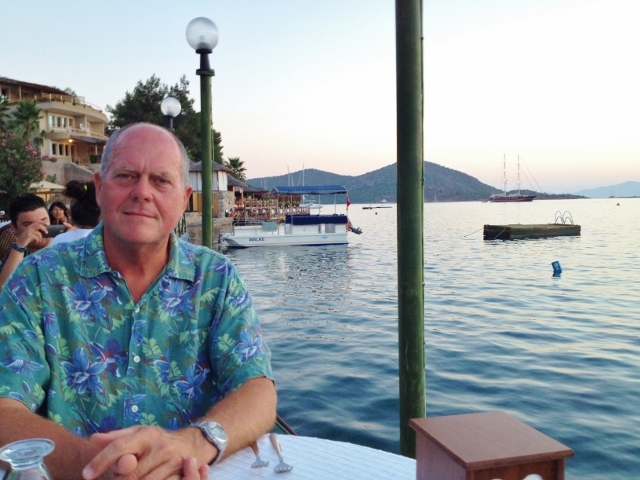 Fethiye has an interesting take on seafood. You go to the bustling fish, fruit and vegetable market and purchase the seafood of your choice then go to the nearby restaurants for them to cook the fish in consultation with your preferred method. 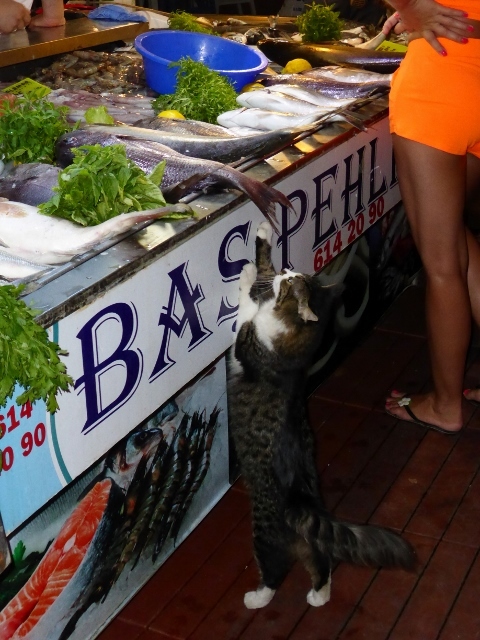 Talk about expert advice, they will even go with you to purchase the fish. This is not the place to come for a quiet evening, no romance here. The noise levels are stratospheric, the TV soccer is playing over the head of the Anatolian musicians. It is a long time between courses but that is ok because we are able to speak to the Turkish friends on the next table. In fact, despite Ivan’s best advice, they talked the poor Aussie innocents into trying Raki. Shot for shot, laugh for laugh, we had made new friends. Sherefe! We left the gorgeous D Marin in Gocek, after a lovely dinner at The Breezes, which ended with Rene begging a young woman to model one of Nat’s gorgeous evening vests. You will see a photo of the vest later. All of you with children know that as parents, godparents or aunts & uncles, we will nurture our young charges and help further their careers and creative endeavors, but not many do as much to assist as Rene does to help Nat. 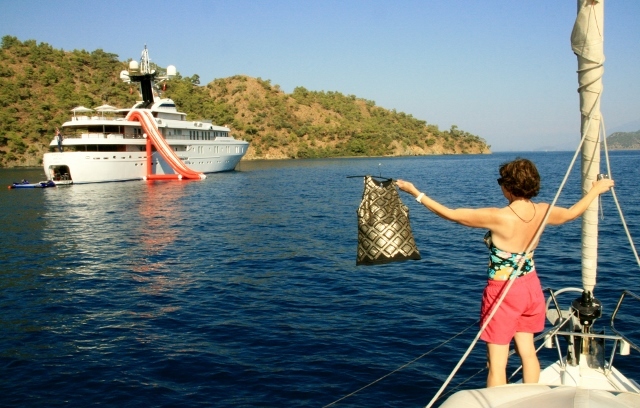 This includes taking an impossibly small sample vest around the world, talk James and Blue into sailing close to glamorous gulets, super yachts and modern ribs for fashion shots. She also accosts young woman in restaurants, who are so small they might actually be fairies or elves, to try on said glamorous top. Rene in photo shoot of Natalie Chapman Designs. Super Yacht was beautiful and witty with a fun slide attached. 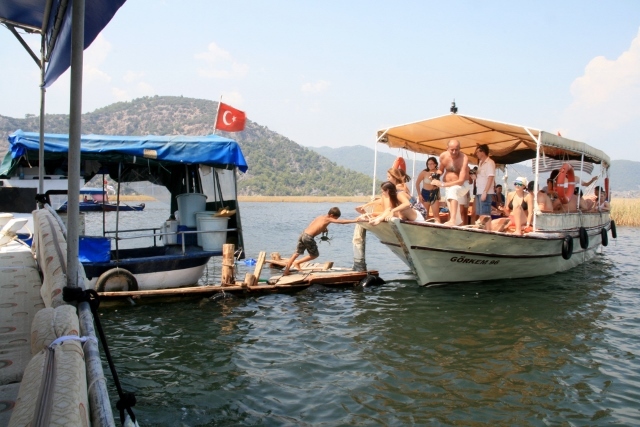 Back to all the bays, we left Gocek to go to the beautiful area called 12 Islands en route to Fethiye. There is Ruin Bay, Tomb Bay, Wall Bay with the lovely Wall Bay cafe, 22 Fathom Cove and Deep Bay, which had lovely moorings, and Cleopatra’s Beach with Baths. Having shopped at the wonderful Gourmet Garage, we had a rib eye roast and lamb cutlets to barbecue so we were off to bays so deep, we could only just set an anchor and then tie our sterns to the shore. In Deep Bay, on moorings, we could open the swimming platform and jump in every 30 minutes or so because the temperatures were 40 plus. You can’t barbecue until after 8PM, because the wasps love meat. We have found a solution: take Turkish coffee and set it alight in a small ashtray or tin can and the acrid smoke sends most of the wasps away. For the one or two that linger, we use the Malcolm Levy approach and employ the electrified tennis racquet. 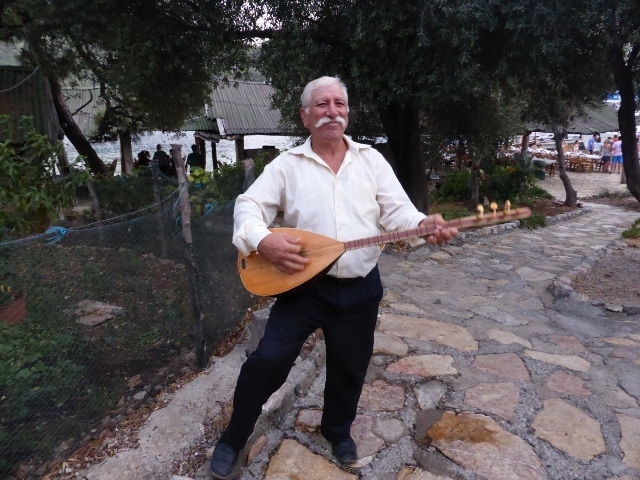 We stayed one night on the pontoon at Wall Bay Cafe, which had Anatolian musicians and a beautiful outlook under the pine trees and stars. 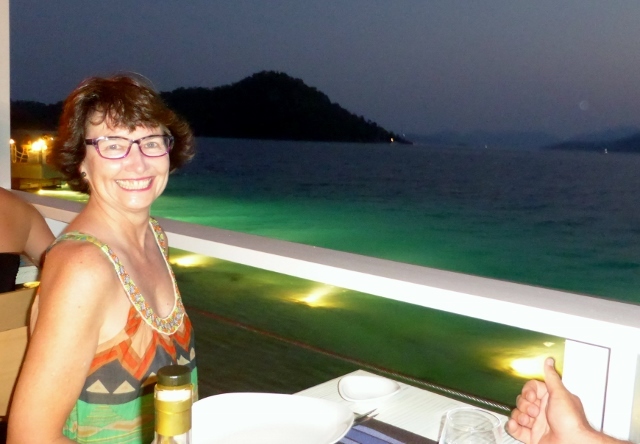 The food was lovely and simple, there was a cooling breeze and yachts and gulets with lights on shining all around Wall Bay and the nearby bays. The heat has been dramatic, we have tried sleeping in the cockpit and on floors. 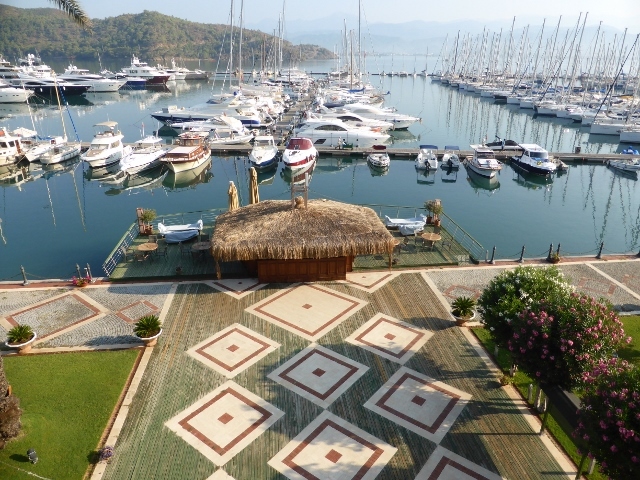 We think we will make our way to Fethiye and a nice hotel with a pool and air conditioning. A few people have asked what we do with Richard, if he starts stressing too much. We don’t want you to worry, we take Richard out to buy Turkish cotton shirts. Rene and I don’t mind because the shops are air conditioned and Blue now has quite a collection. Still we have a naughty corner, if he gets too out of control. 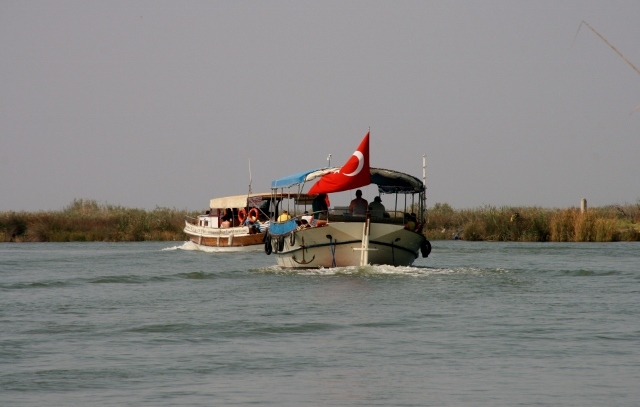 Ilyas Kaplan from Sanem Tourizm took us on our very own boat, from Ekcinik Koyu, to the Dalyan Delta. 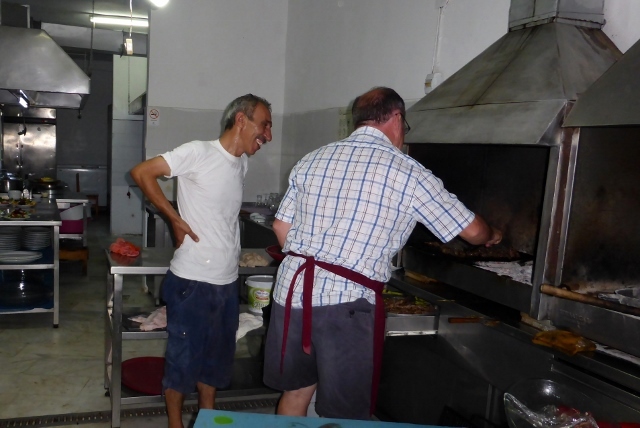 Ilyas dropped us off for a tractor ride up to Caunos, after our walk through the ruins, he collected us and we went on to the town of Dalyan for lunch and a visit to the market. 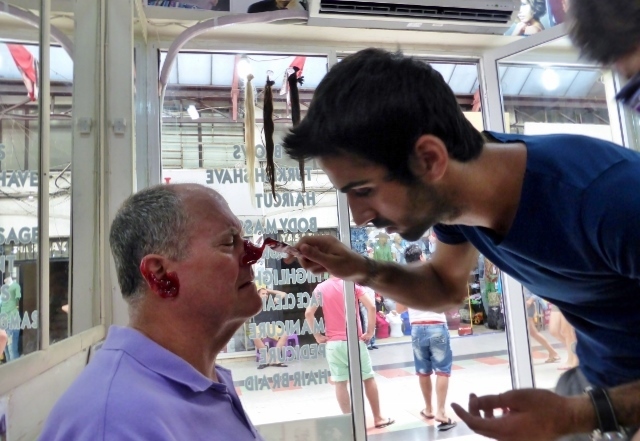 I am sure Dalyan is a lovely town nine months of the year but in the heat of August, we strolled rather languidly around the ‘market’, which was tourist trap central. We thought it better to spend our time eating mezes in a waterfront cafe. Actas. 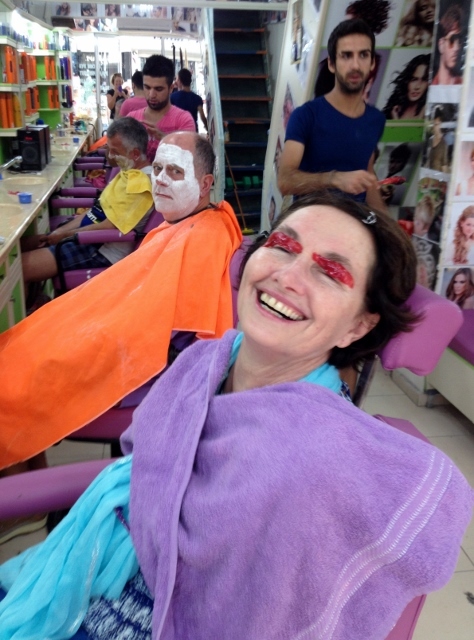 While watching all the river boats, we considered going to the thermal baths with the other thousands of tourists that were now pouring in from the Lake and even on tours by road or boat from Marmaris, Gocek and Fetiyhe, but the sheer numbers kept us in the restaurant with baklava. Big Flag, Frosty, wouldn’t you say? From Actas Restaurant, the Lycian Tombs were directly above us. 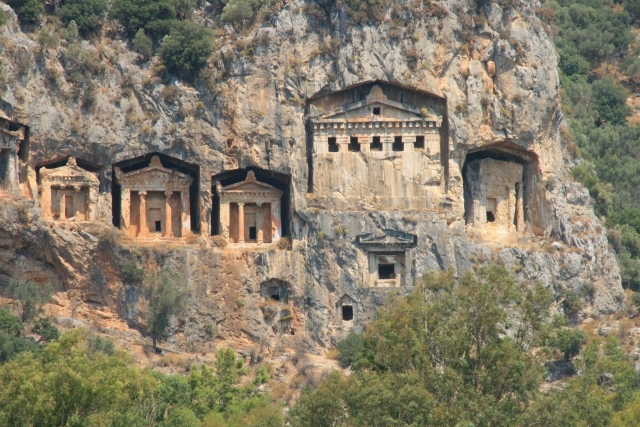 The Lycian Tombs were tombs created high on the cliff with an edifice that looked like a temple, a house or a pigeon hole. Ilyas said the large temple tombs were known to be the tomb of a Prince but it seems all the Lycians were practitioners of ancestor worship. The tombs are amazing, such a romantic setting which set our imaginations racing. We boarded the river boat once more and headed back down to the Turtle area, where we collected our freshly cooked crab for a return trip snack and then off to the sand bar for a swim. Turtle feeding station in the morning, selling crab in the afternoon. From the morning’s almost deserted journey, now there were hundreds of people at the sand bar beach. Now this story has been in two parts, most people would have gone back to their boat and had a quiet little drink. We all know Blue though, we went to dinner and Blue asked how something was cooked and before you know, he is there offering advice to the chef. They just told him to cook it. The four of us have been having fun but today took a different twist. We trod the educational path, not once but three times. 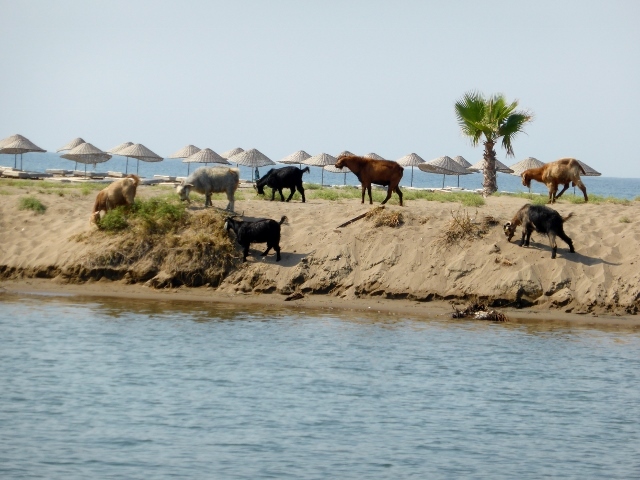 We are in Ekincik which is a pick up point to go on a local boat for a trip to the Dalyan River. Our guide,Ilyas Kaplan, picks us up early and first takes us to a cave with stalactites. The most interesting part of this is how far into the cave this little boat can go and I am reminded of the stout boats that Odysseus sailed about in. They sail right onto the beaches with no problem at all. Our next stop is Iztuzu or Turtle Beach, one of the beaches these Mediterranean Loggerheads (Caretta Caretta) have been coming to for around 95,000 thousand years according to local lore. 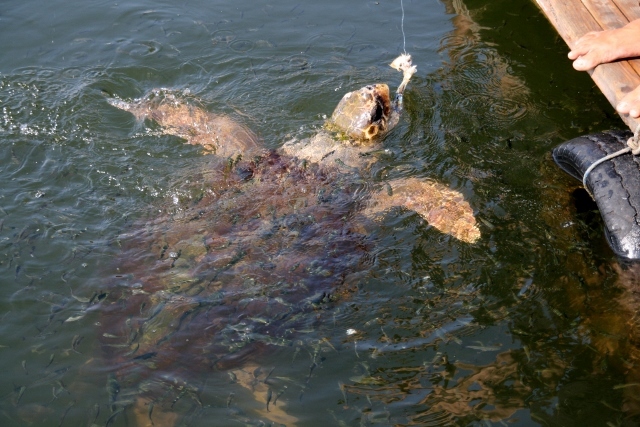 The turtles have breeding grounds here and also in Zakynthos and on beaches in Libya. The hatchlings have to dig out during the night and not surprisingly some turtles had hatched recently, with the August super moon. 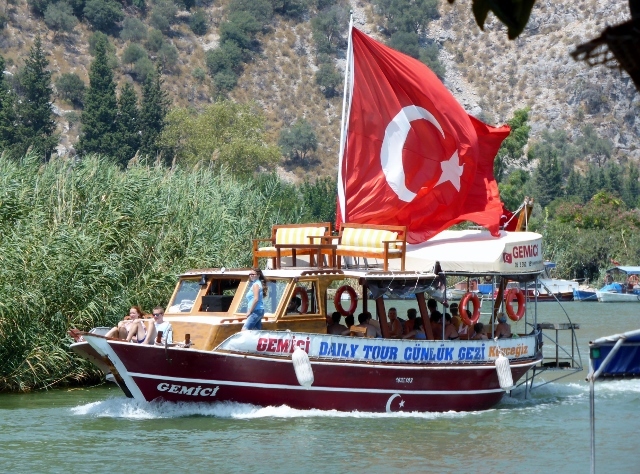 The tourist industry to come to see the turtles and other sites in the Dalyan Delta are massive and growing both by ferry, ship and by road and small boats. Only small local boats are advised to sail through the delta, many of them are cooperatives and create work for local villagers. There are a cadre of boats that feed the turtles fresh crab, so Ilias took us up to his favourite spot and the turtles came in. We had seen smaller turtles on the way just swimming in the water. 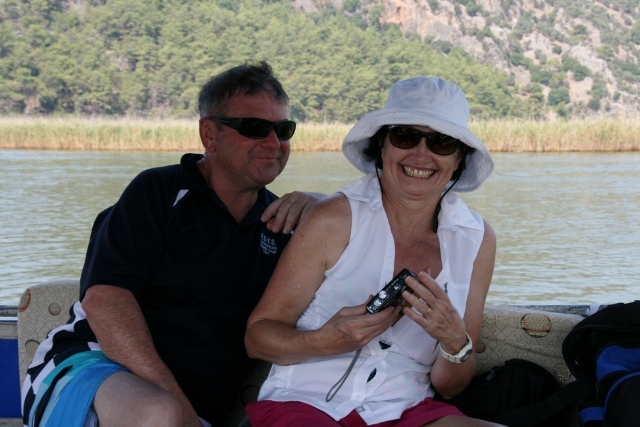 We sailed through the labrynth of reed beds and sand bars up to the Ancient city of Caunos (Kaunos). Like Epheseus, Canous had been a port town but the river silted up so it is now inland. 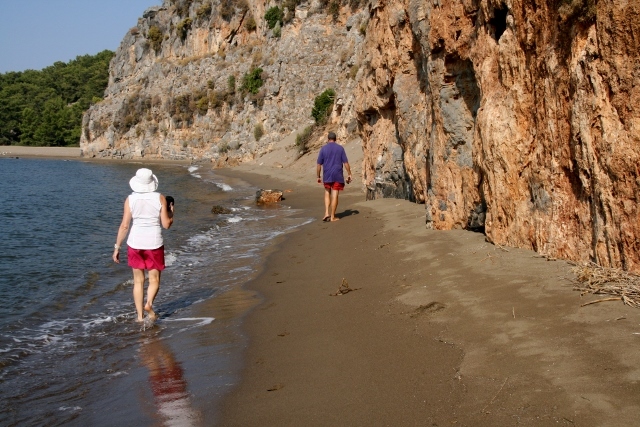 Homer talked about Canous, the Carians and the Lycians; the Dalyan River is the meeting place of those three cultures. We saw temples, theaters and ruins in Caunos. Canous might have eventually become a ghost town because of malaria.The theater is the most intact building on the site. Like the theater in Kos, it would have held 5,000 people. Closer to the old harbour there is a temple and the Agora. The Acropolis is at the top of the hill above the theater. There was more to the day, but it was time for lunch, so we promise more tomorrow. Today, we want to say Happy Birthday Charlene Bradley. We know you are having a good time. 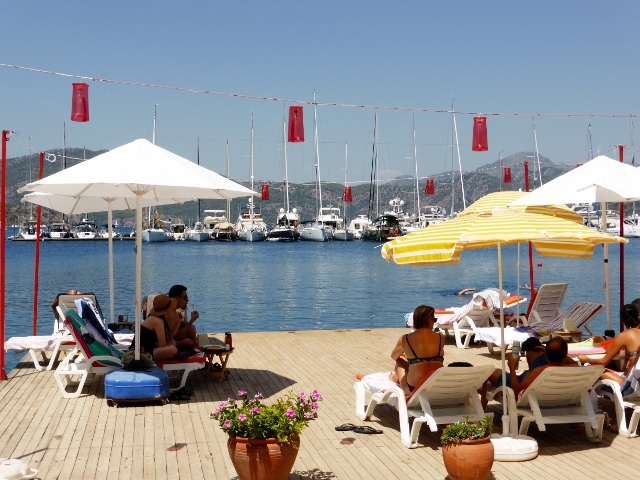 What did you do on your first day in Marmaris? 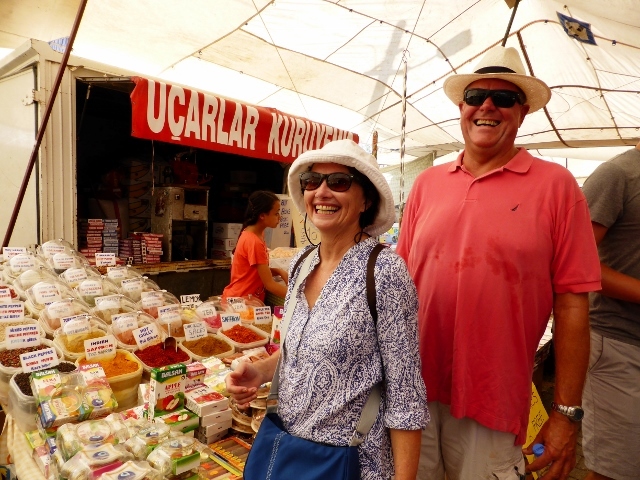 Richard and Rene arrived on the ferry from Rhodes and after a coffee on board Mercier, we went looking for the vegetable markets at the Bazaar. 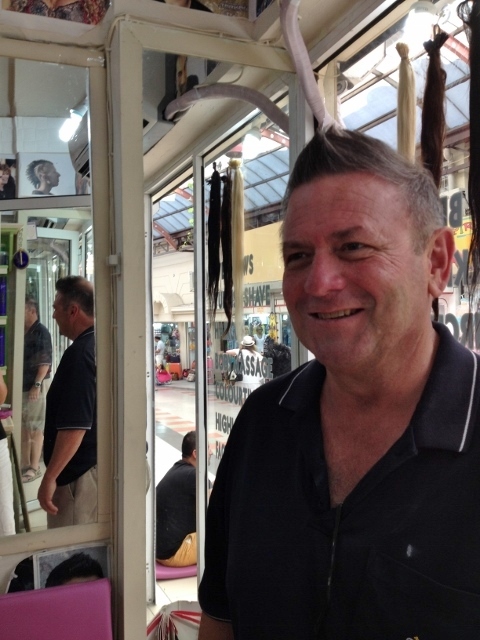 Instead Ayjin the Barber saw us and decided the boys needed to be made “younger”. Here are the photos. Ayjin explains that Blue doesn’t need those hairs on his nose. Dancing distracts the client from the pain of having the wax removed. The music was turned up to max volume, so the screams couldn’t be heard. 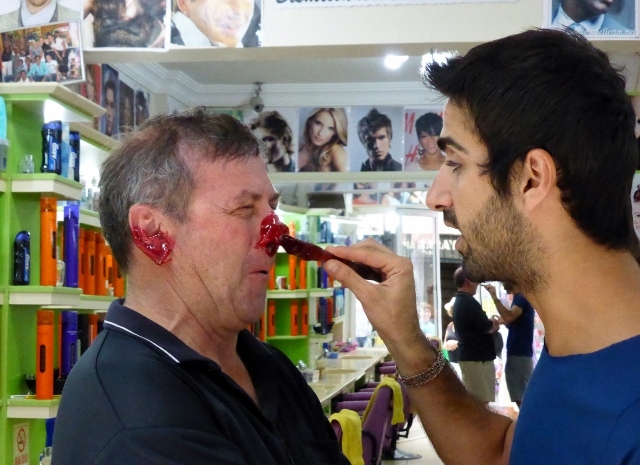 The Turkish fire shave gets those pesky hairs from your ear. 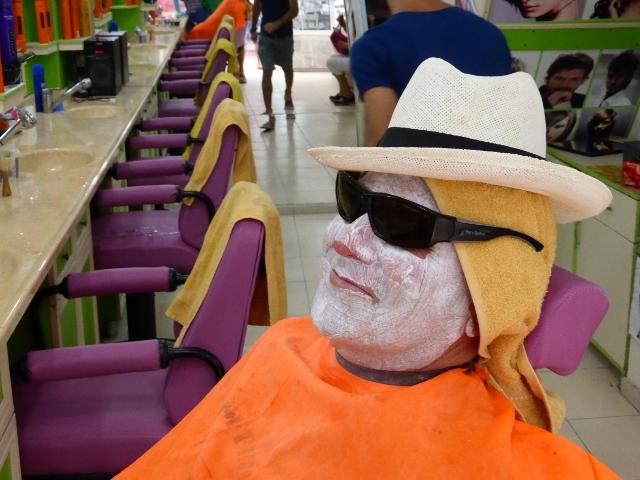 a straight edged razor shave and then a mask before the haircut. How do you feel about going blonde, Blue? Ayjin leaves Blue and gets James in, look at that wax! 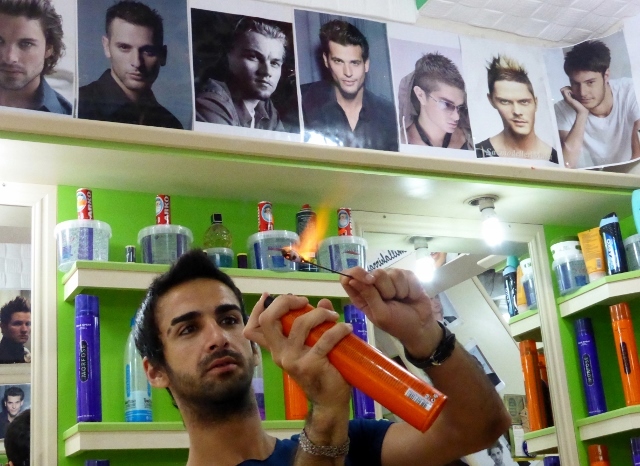 The sequence of events is waxing, threading, fire in the ears, massage, straight edge razor shave,masque, hair cut, trim the eyebrows and all while dancing and doing Michael Jackson impersonations. Rene’s eyebrows next to go. James looks tentative or like cousin Fester, take your pick. 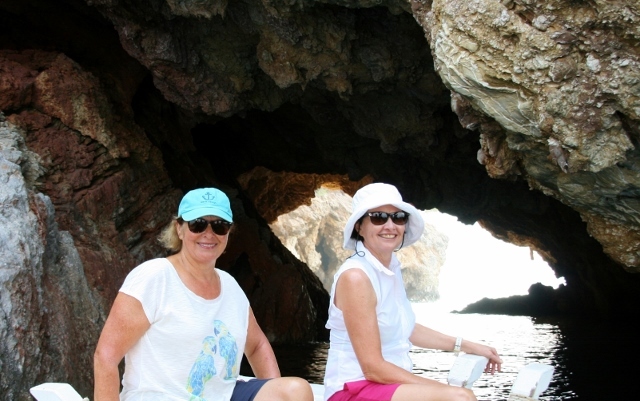 We sailed into Shipwreck Bay or Serce Limani on our way to Ciftlik Limani. Watching a gulet depart from the bay, it seemingly sailed out of rock. The harbour is tricky with shifting winds and gusts. 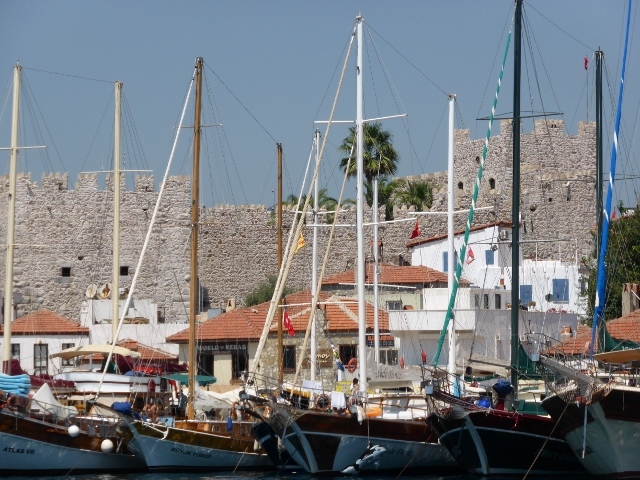 In Bodrum, at the Castle of St Peter, there is an Underwater Archeological museum and Glass museum. It was in Serce Limani that the Byzantine Shipwreck was found full of exquisite glass. You see the glass under low light in the museum to protect its colours. The Byzantine ship foundered in the 11th Century. Rod Heikell reminds me that the excavation of the ship was carried out by Dr George Bass, they know the crew was Byzantine and not Islamic, because although the crew made it to shore, all food and effects were left on board and in the food their were pork bones and remnants. 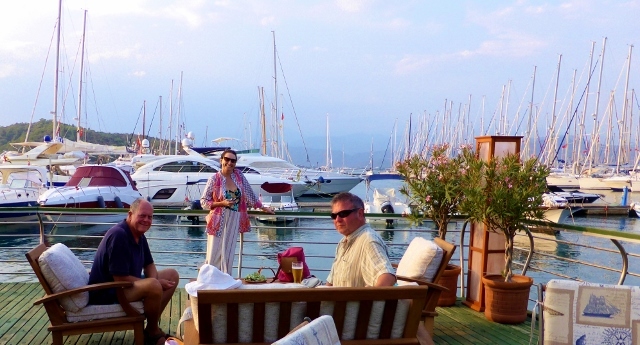 We had a pleasant motor to Ciftlik Limani and were waved into the dock of Azmak’s restaurant. It is always wonderful to have help on the dock, not to mention electricity. We swam and watched all the boats come in including gulets with music turned up so the whole bay can hear it. 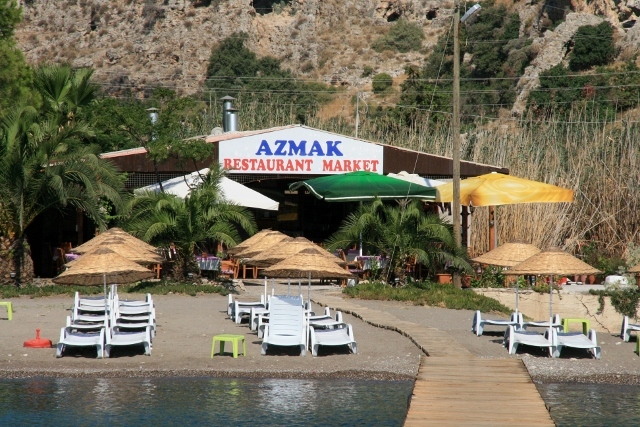 Eating right on the beach at Azmak’s, with locals and tourists. Some of the freshest, tastiest sea bass, prepared so that it was tender and moist. 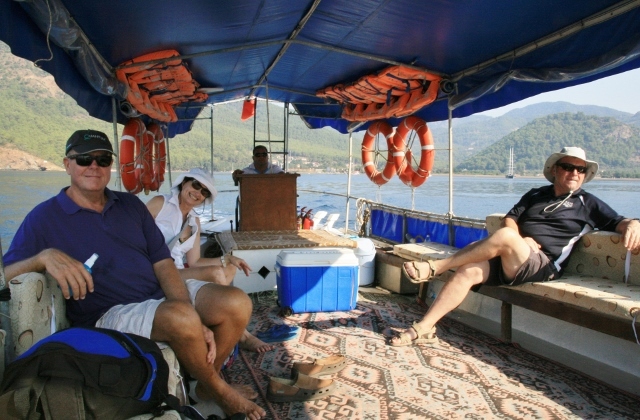 The next morning we were on a longer stretch to get to Marmaris. 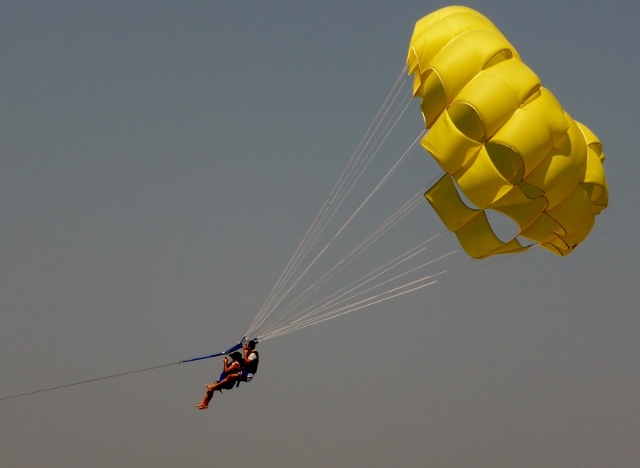 We want to be in on Saturday as Rene and Richard arrive on Sunday morning. Happy Birthday to Kim B and Sonya, hope you both get spoiled. Here is James, singing you Happy Birthday. 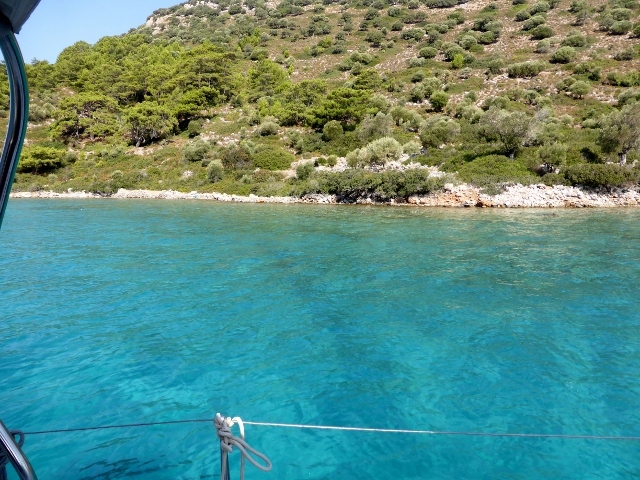 Mercier is sailing in beautiful waters, crystal clear and warm, along the Bozburun Peninsula. 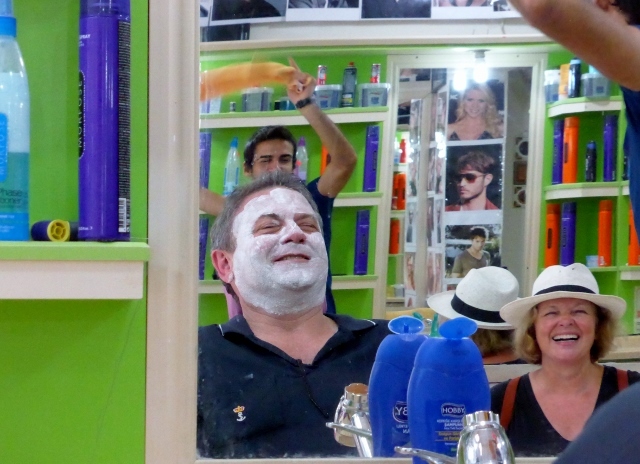 On Tuesday, we sailed into the marina of Selimye, a striking little village full of boats and holiday makers.The weather is very hot and water is the key to being comfortable. Jumping into the bay to cool down or turning on the hose on the jetty, or water in the form of ice are saviors in this sort of weather. We decided to explore the town and have lunch saving a salad dinner for on board Mercier later in the evening. It can be too hot to eat at night. 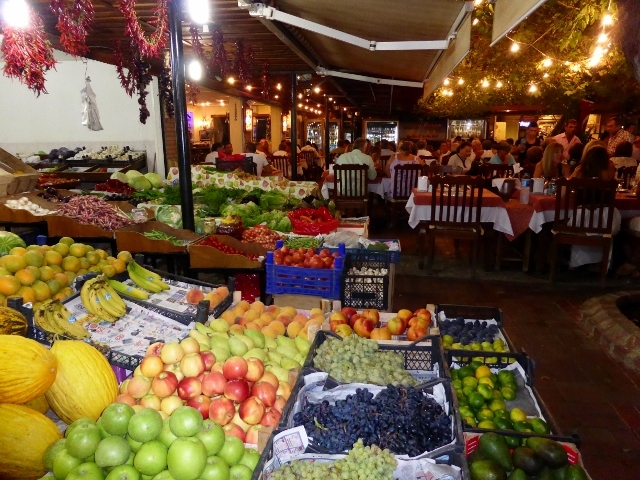 The village is full of shops, green grocers, restaurants and pensione or as they are known in Turkey, pansiyon. After wandering around town, we stopped at a lovely cafe attached to a pansiyon. Nane Limon Pansiyon had a swimming platform and cafe in the midst of Hellenic ruins, with tables, couches, lounges and a hammock between the fig trees. 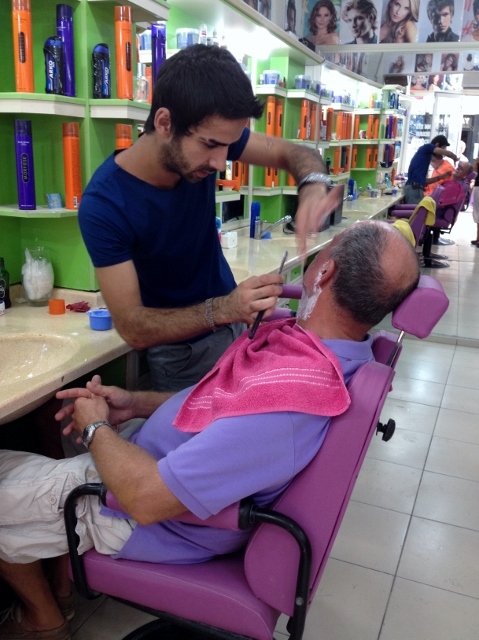 On Wednesday morning, we continued down the Bozburun peninsula, to the village of Bozburun. There is a small marina there but it looked a bit noisy and hot so we tried moving back out to the mouth of the harbour where there are several restaurants with boat moorings available, the breeze was fantastic and so was the view. The arrangement is that you stay on the mooring or stern to on the restaurant’s quay and have dinner. I am perplexed as to how they don’t have a minimum spend but they haven’t seemed to thought of it yet. Hotel Aphrodite was a very good mooring, much cooler than being in the main part of town and there are a couple of other nice restaurants nearby. We are sailing over to the ancient town of Loryma, down the Carian Coast. 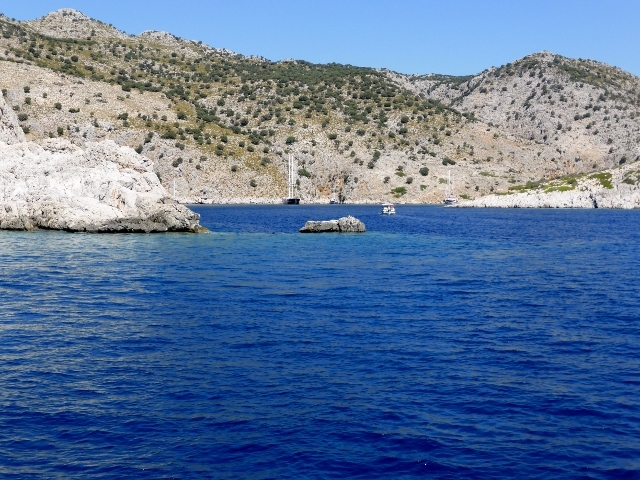 Compared to sailing in Greece and Croatia, we see incredible numbers of beautiful boats here. 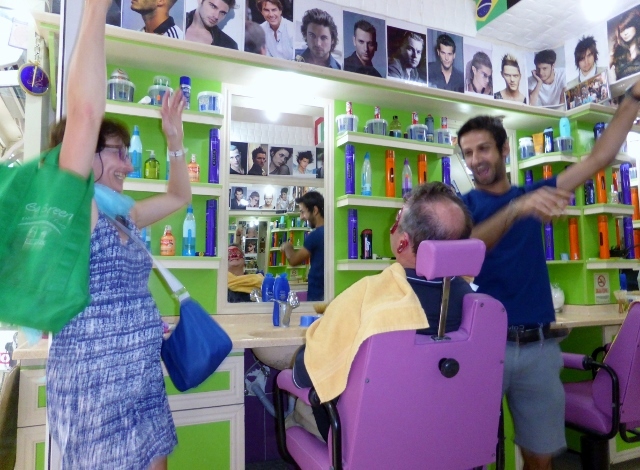 In a few days we will meet Rene and Richard in Marmaris.